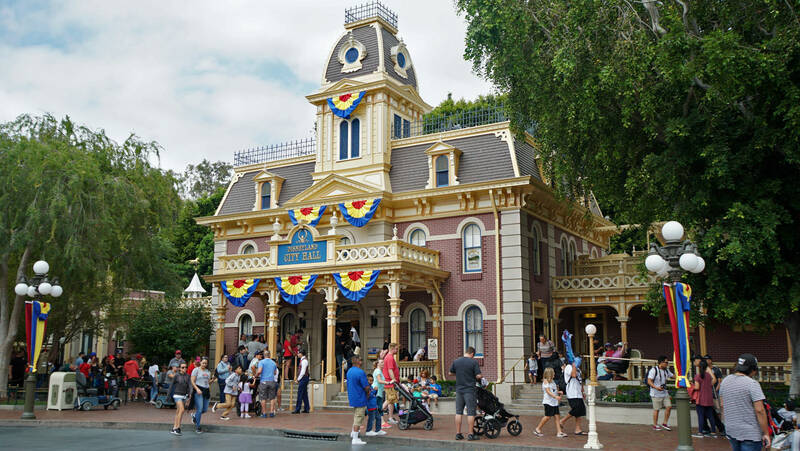 Disneyland, California was the very first Disney park to be built, opening July 17, 1955. 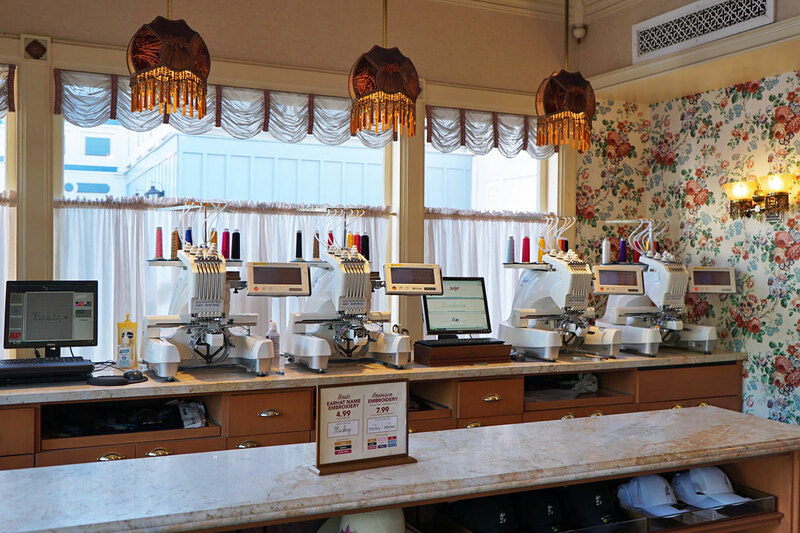 While it may be the smallest of the Disneyland parks, it is by far the most charming. 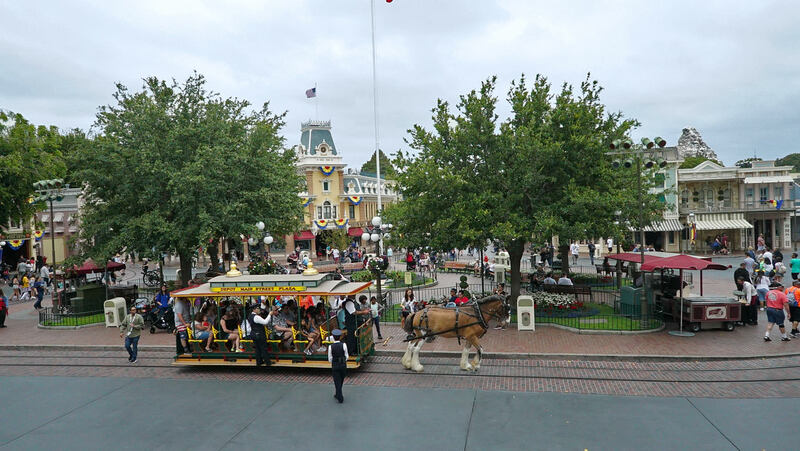 Passing through the entrance gates and under the railroad tracks, Main Street USA's Town Square is the very first area to greet the park's guests...over 18 million guests in 2017 alone. 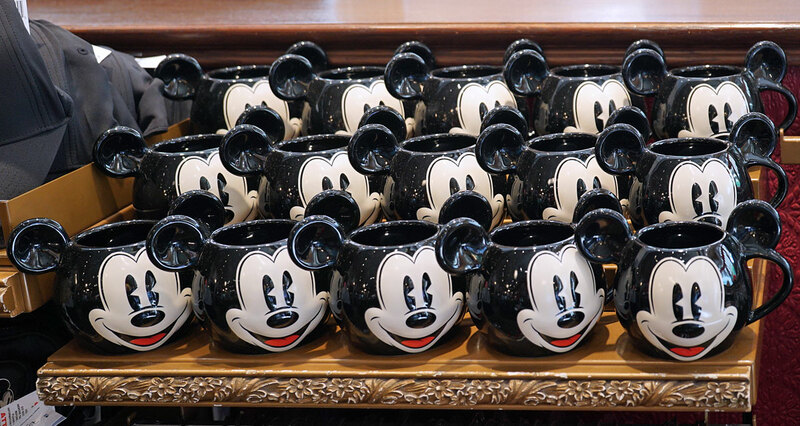 More than 700 million guests have visited Disneyland since it opened, making it the most visited theme park in the world! You'll find the Stroller and Wheelchair rentals right outside the main entrance. This plaque greets visitors as they pass under the railroad tracks to enter Main Street USA. 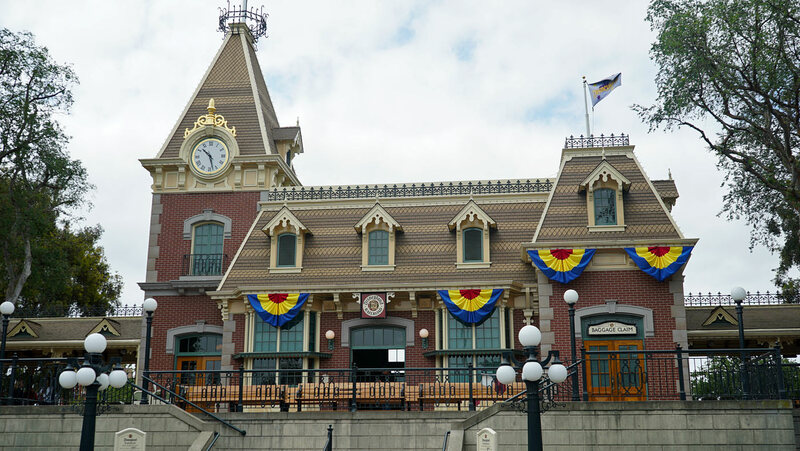 Disneyland Railroad's Main Street station. Welcome to Main Street USA, Town Square. Here is a turn-of-the-century small town modeled after Walt Disney's memories of his childhood hometown of Marceline, Missouri. 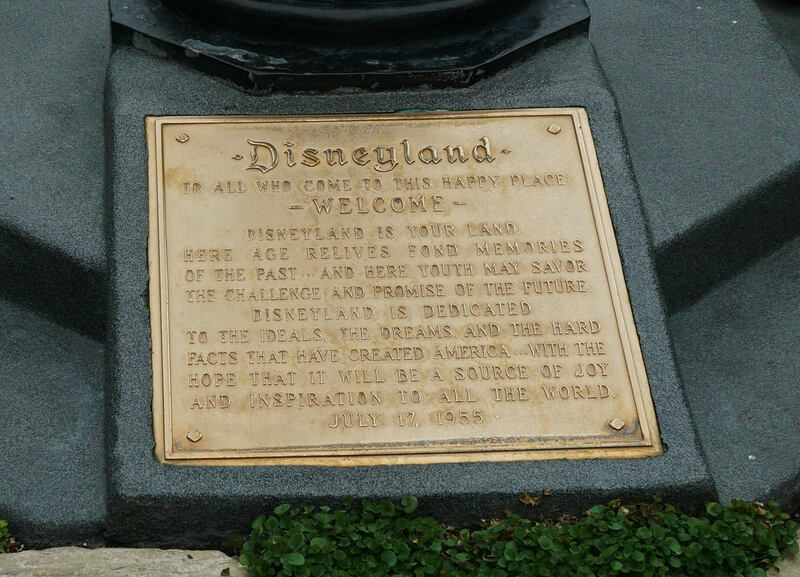 Disneyland's dedication plaque can be found in the center of Town Square at the base of the flagpole. 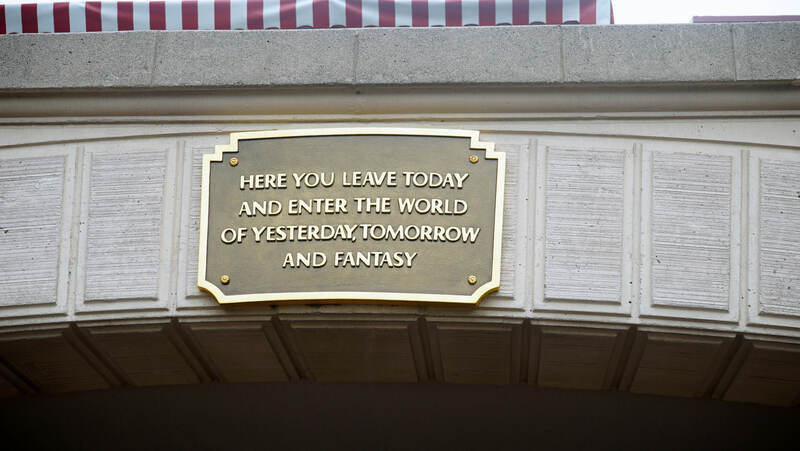 Walt Disney voiced these very words on opening day. 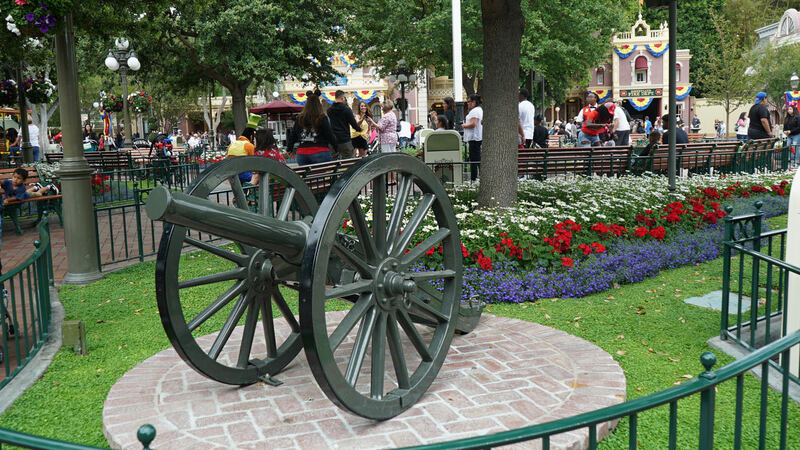 This canon is on display in the small, tree-lined, triangular-shaped park in the center of Town Square. 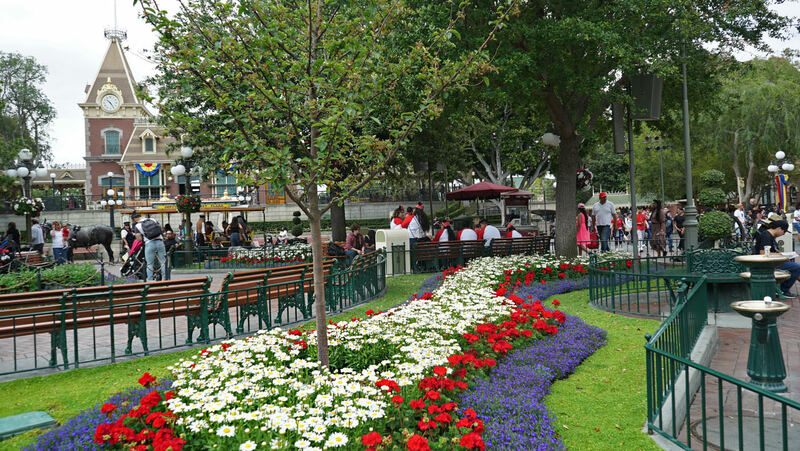 Beautiful floral arrangements line the Town Square park. You can grab some freshly popped popcorn here. 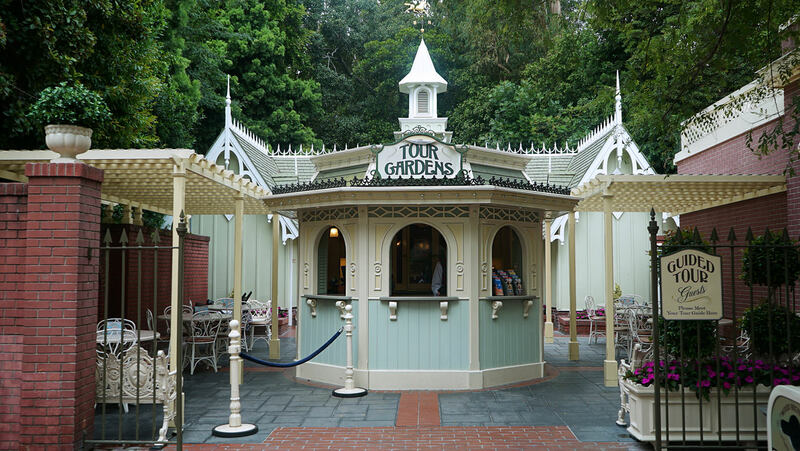 Opened in 1958, the Tour Gardens offers guests special guided tours of the park. 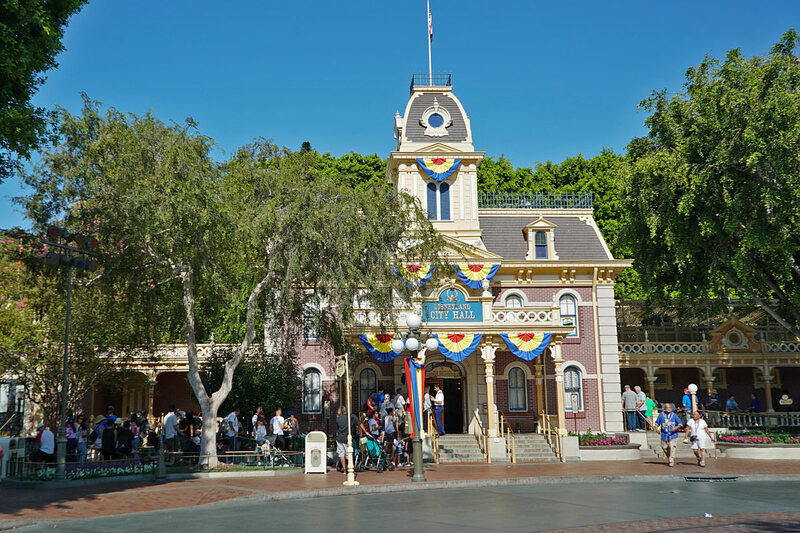 Tours include "Walk in Walt's Footsteps", "Disneyland's Happiest Haunts", and "Holiday Time at Disneyland". Tours can be booked up to one month in advance. 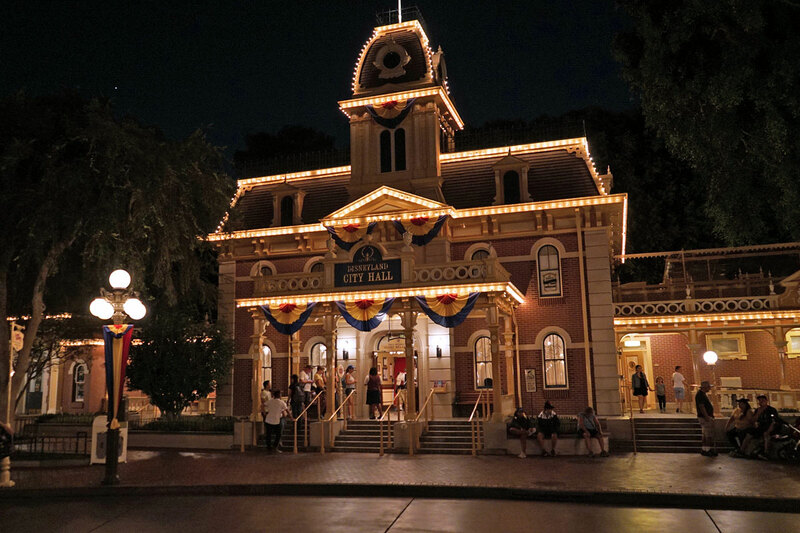 The Disneyland City Hall stands proudly over Town Square. 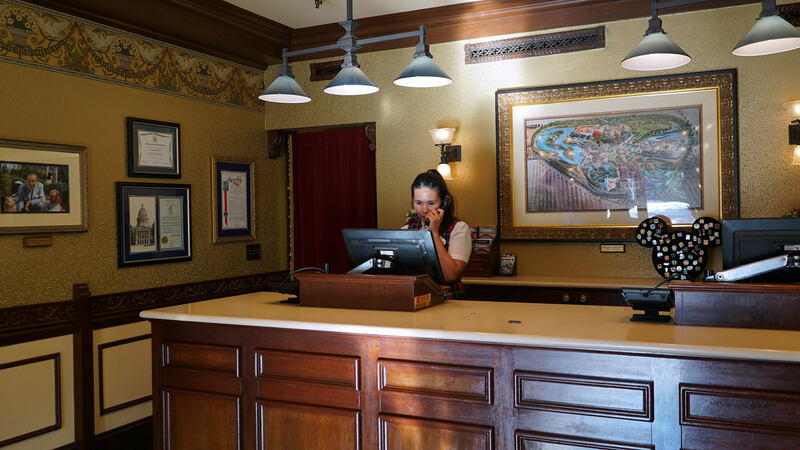 It is home to the park's guest relations and information center. Next door to City Hall is the Police Station...or it used to be. The police station sign has since been removed, leaving this building without an identity. 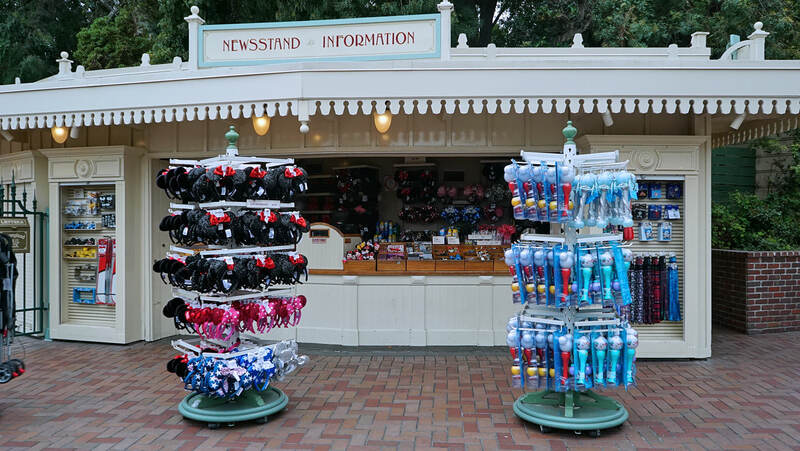 Situated right outside the entrance gates on the right side, is the Newsstand Souvenirs. 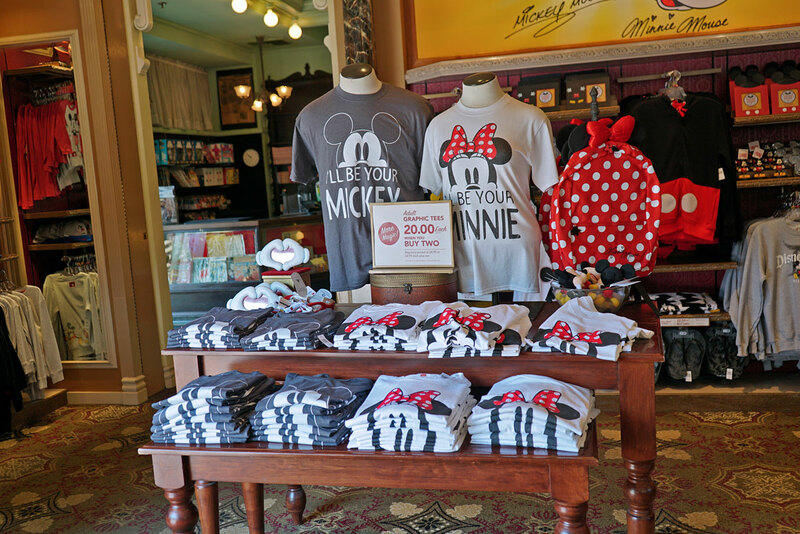 Here, guests can grab a last minute souvenir of their visit to Disneyland. 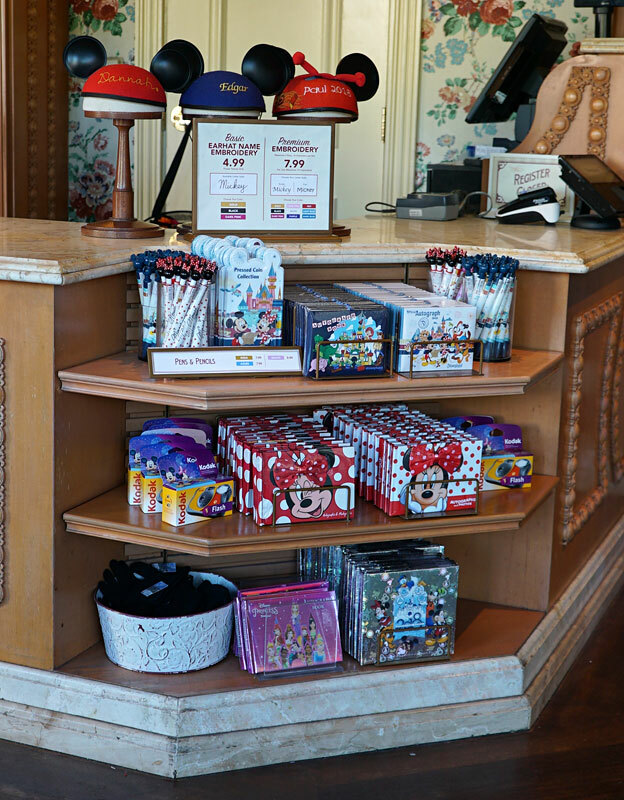 Here you can get hats, Mickey & Minnie ears, pencils, and other small items. 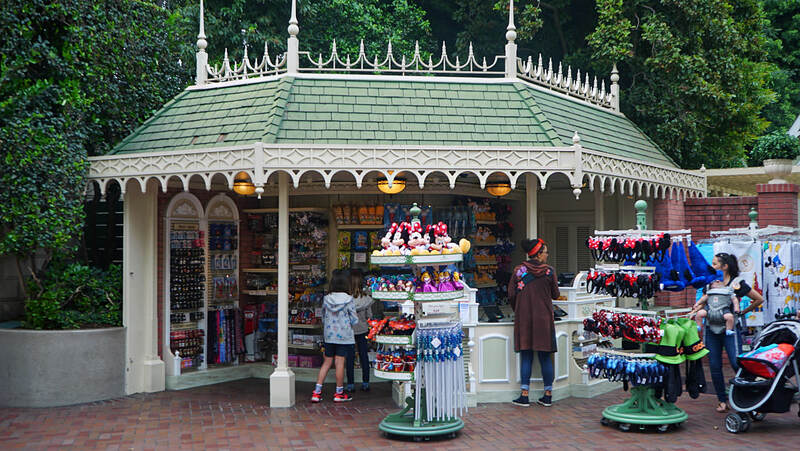 Items purchased within the park can also be held here for pick-up on the way out. 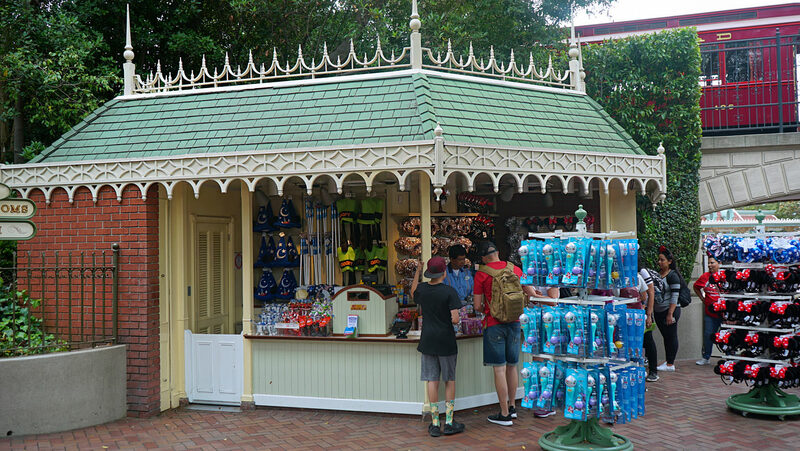 There are two more smaller souvenir stands, just beyond the tunnels into Main Street. 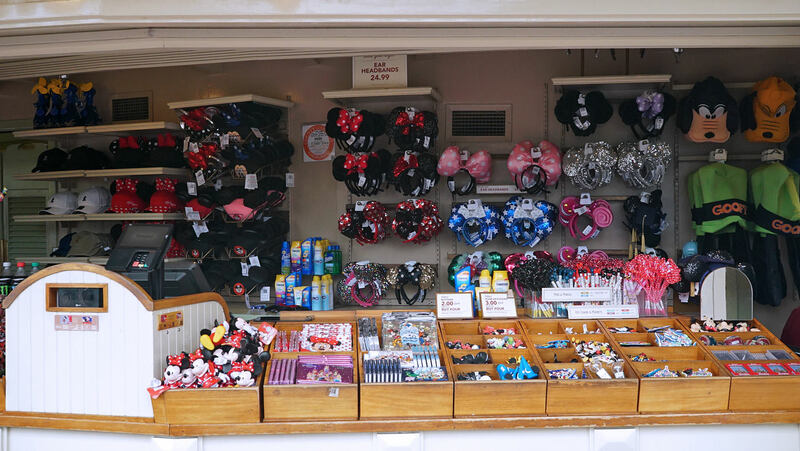 This is the Souvenir Stand West. 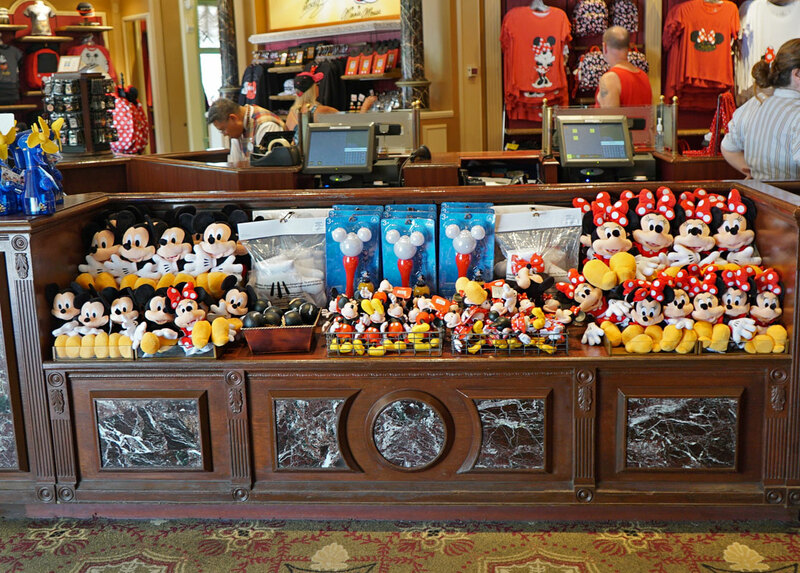 And this is Souvenir Stand East. The mom with her child strapped to the front of her, in the Souvenir Stand West pic, kinda makes me cringe. Reminds me of the character, and his conjoined twin, from the Schwarzenegger movie Total Recall. Bet that kid ends up bow-legged for the rest of his life. 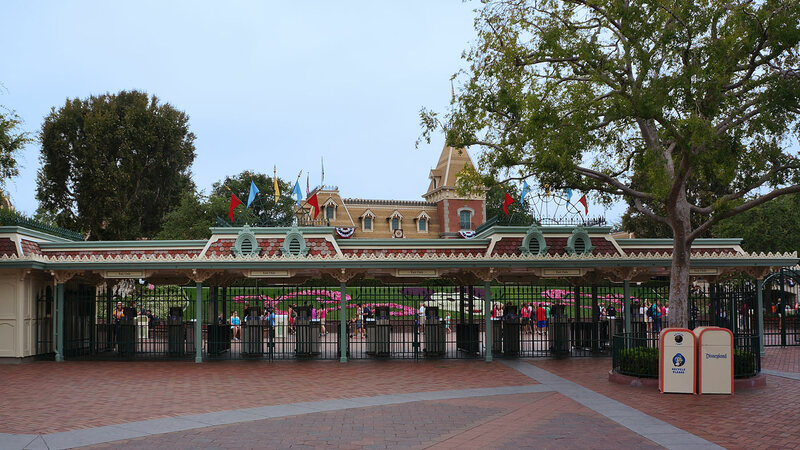 I love Disneyland pictures; I've been downloading many of the ones you've been posting here in the Turnstile Tribune. 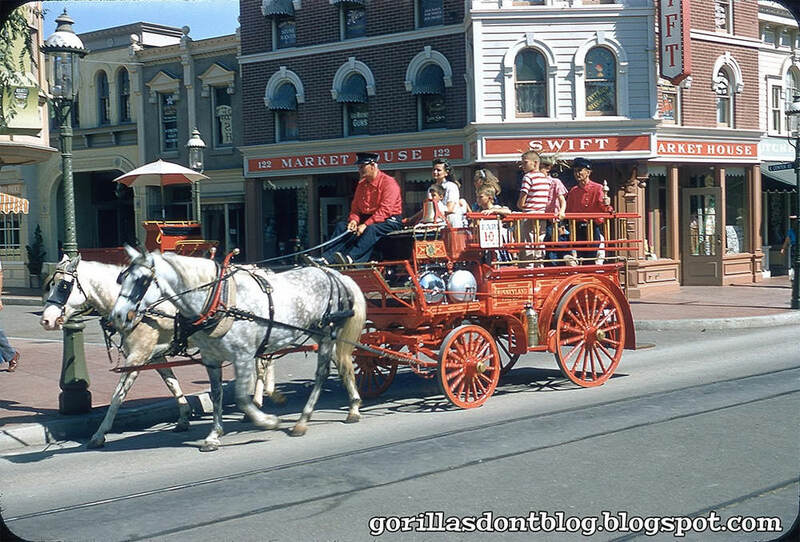 I've also been going through all the vintage Disney 35mm slide scans at Gorillas Don't Blog. Heard of it? Fun site. (Hope it was okay to mention it here. That's a great site. Love the vintage pictures. You'll probably see a few of them in these articles when I make historical references to old attractions. The mom with her child strapped to the front of her, in the Souvenir Stand West pic, kinda makes me cringe. Taking pictures without having distracting peeps in them is so difficult. I sometimes have to wait forever to take a photo without someone extremely distracting standing in view. People with multiple strollers, wheelchairs, enormous people, people standing right in front while having a half hour conversation on their cell phone...the list goes on. 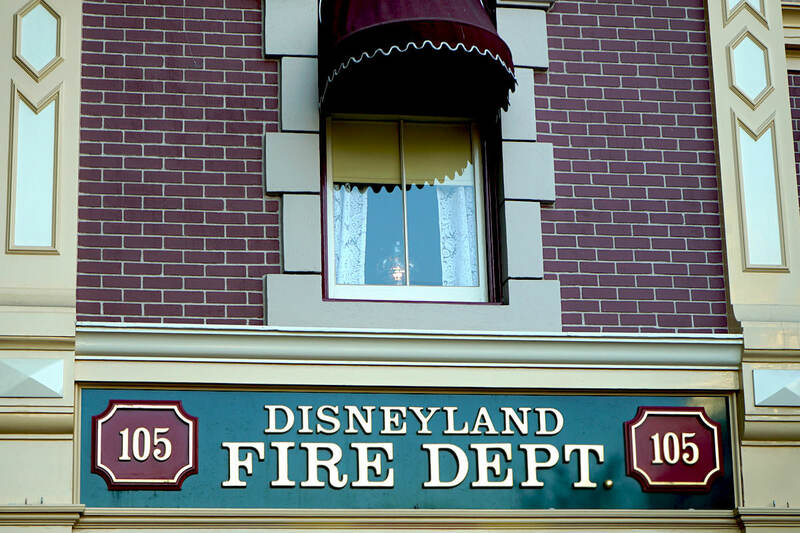 Next door to City Hall is the Disneyland Fire Department. 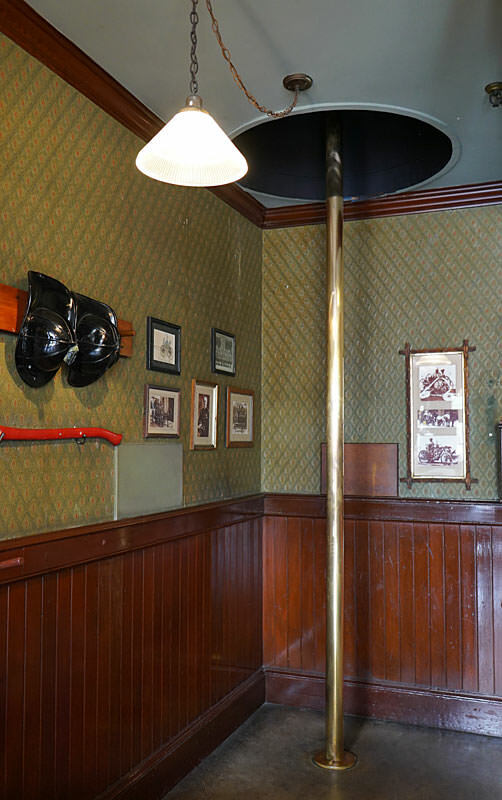 Inside, is a display of an old-time fire house with actual fire-fighting equipment and antique furniture. 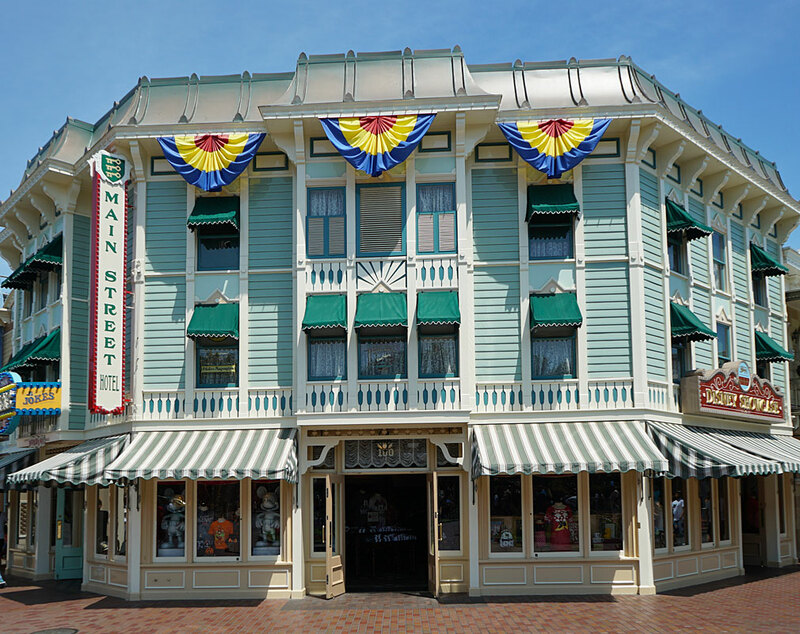 But what real Disney fans get excited about is that Walt Disney's private apartment is located above, on the second floor. 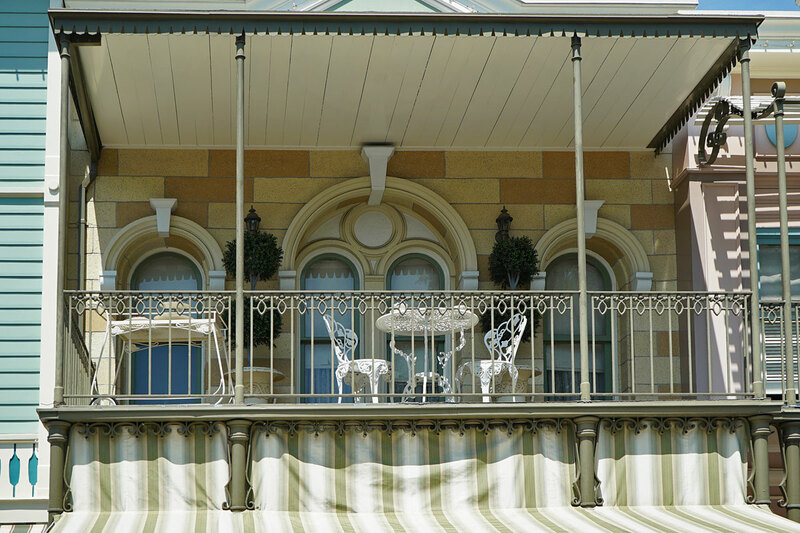 To the left is the balcony in which Walt spent time, viewing the crowds below. 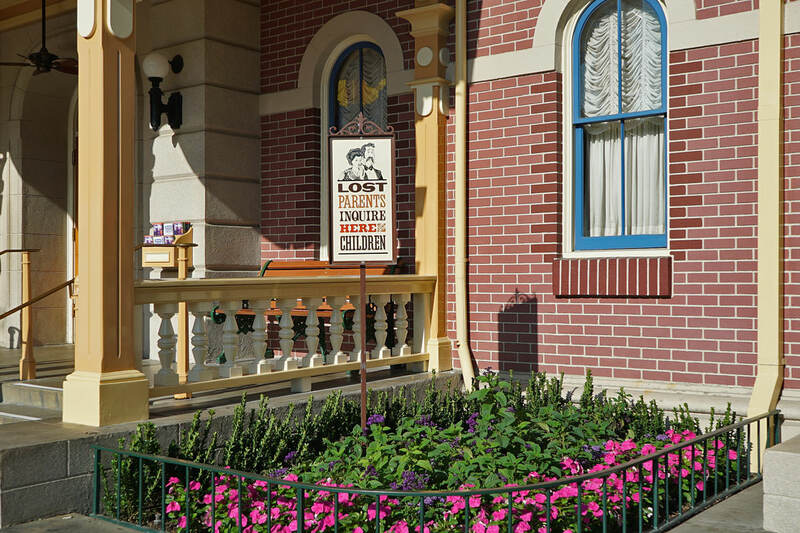 A light in the upstairs window is always kept lit, in memory of Walt Disney. It is said that park employees always knew when he was in the apartment when the light was on. 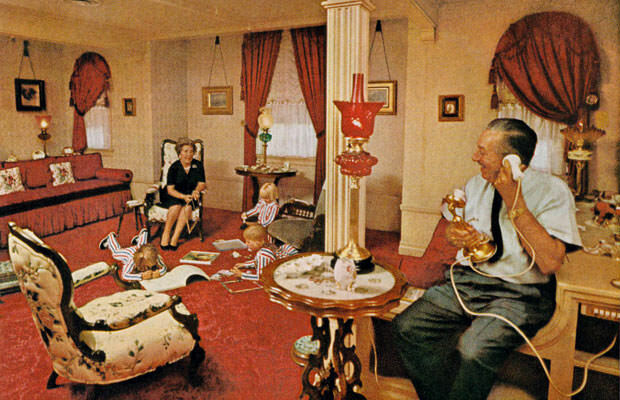 One of the very few photos in existence of Walt inside the apartment. 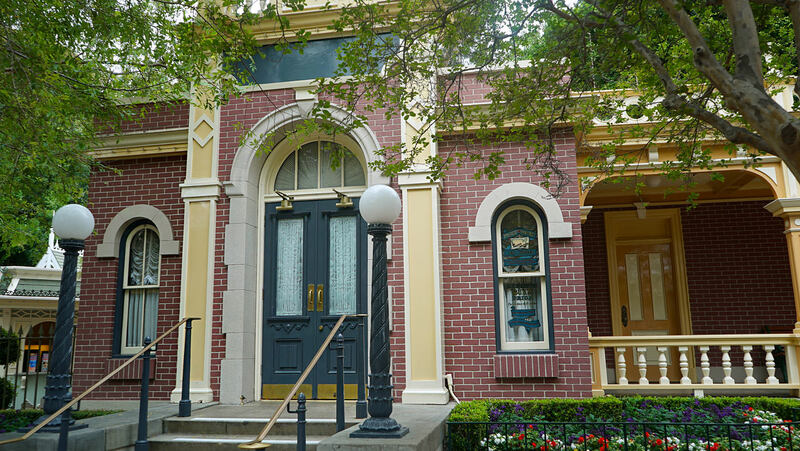 Check out this news story that takes you inside Walt's apartment. Parked inside the Fire Station is a horse drawn fire engine. This beautiful red wagon once took visitors for rides up and down Main Street until 1960, when it was withdrawn from surface. 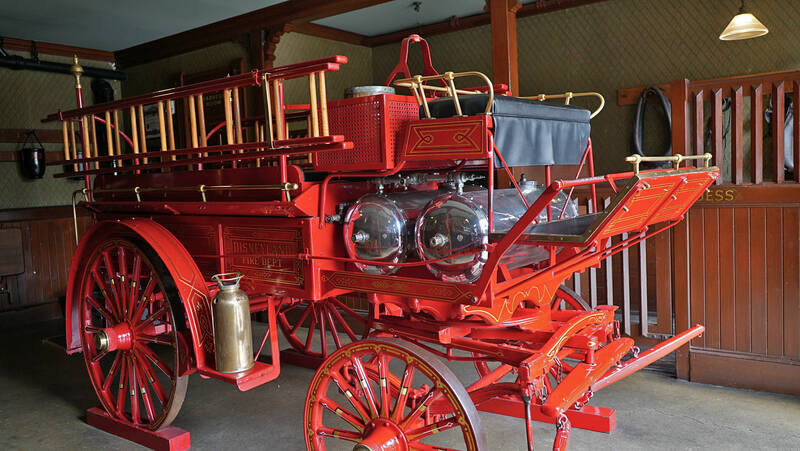 You can still climb aboard the fire wagon. But you won't go anywhere. On old photo of the Horse Drawn Fire Wagon in operation. 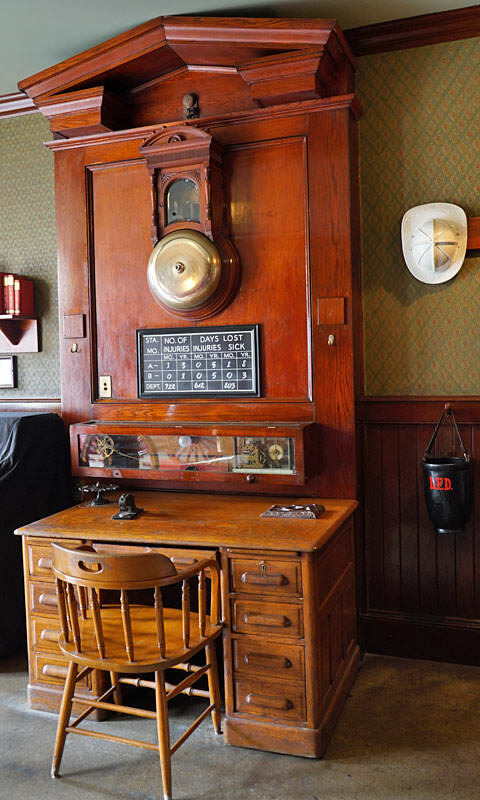 Inside the Fire Station, antique furniture and fire fighting equipment is on display. 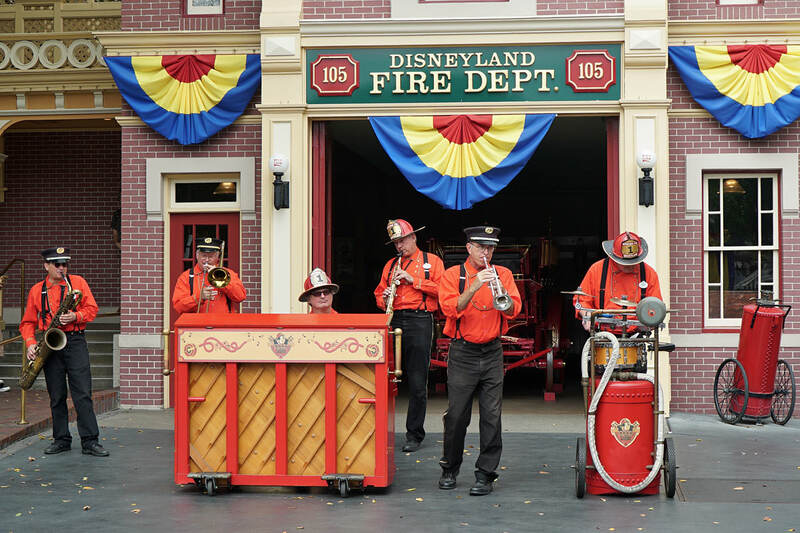 If you're lucky, you can catch the Hook and Ladder Co. performing outside the Fire Station. 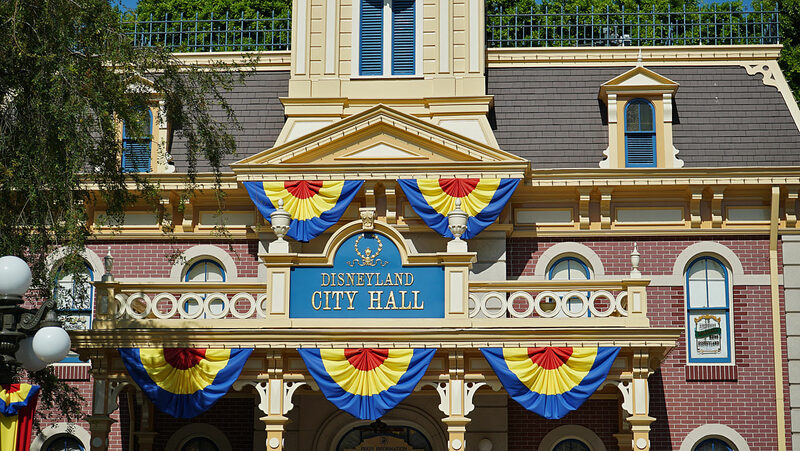 Disneyland's iconic City Hall has occupied its prominent spot in Town Square since opening day in 1955. 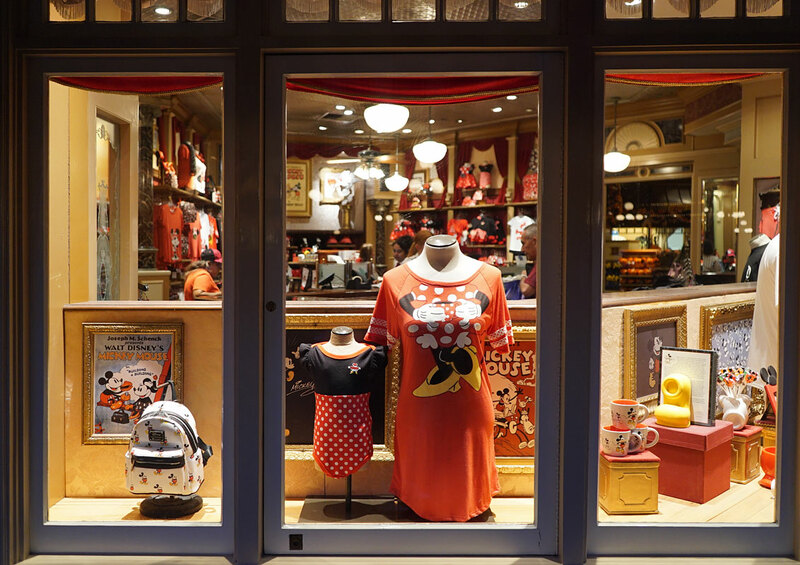 It was designed by Disney legend, Harper Goff, based on a similar building in his Colorado hometown. 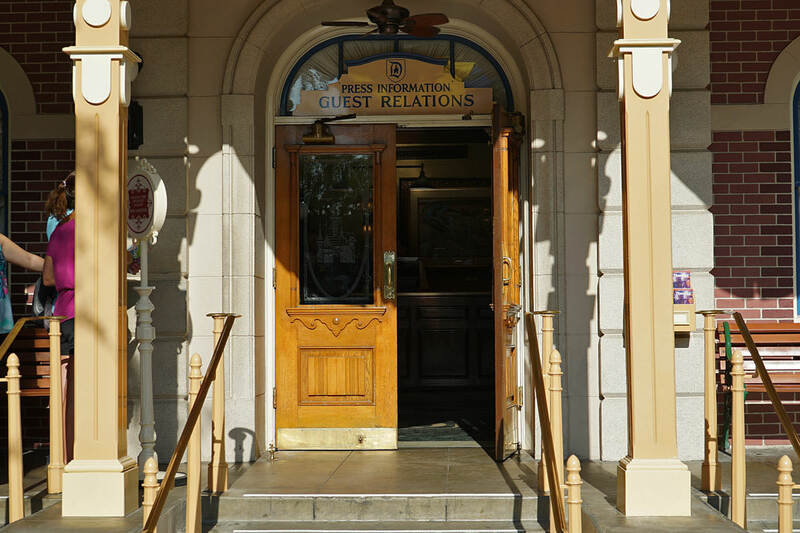 City Hall is houses the Guest Relations and Information Center for Disneyland. "Lost parents" services are provide here as well. 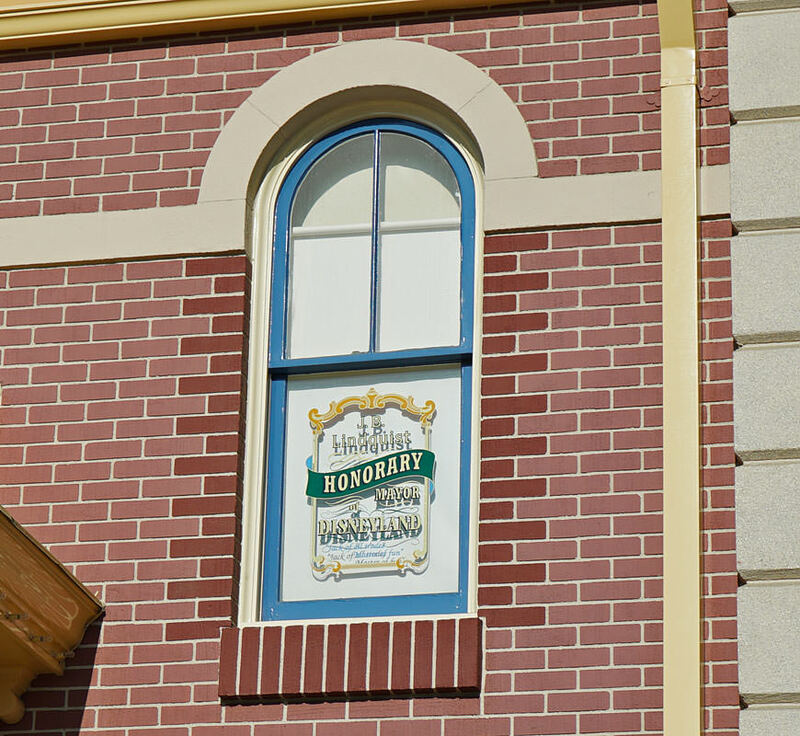 One of the most treasured traditions in the parks is the honor of having one's name placed on a window in Main Street. This window is dedicated to J. B. Lindquist, former president of Disneyland from 1990 to his retirement in 1993. 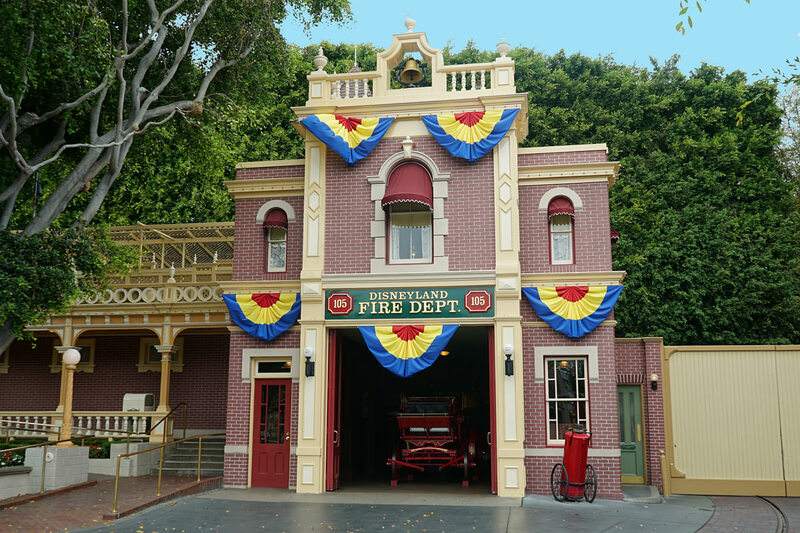 He was an employee for the park since 1955, which included marketing director for nearly 30 years. 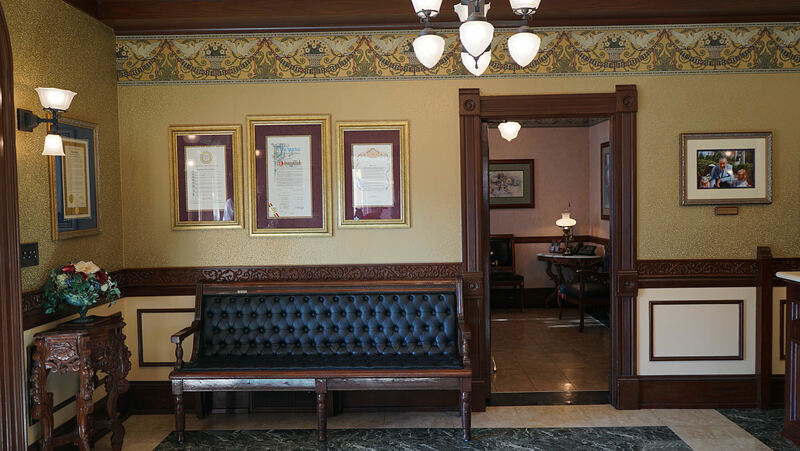 The entrance foyer to City Hall with its beautiful Victorian decor. A framed aerial view of Disneyland, circa 1955, by artist Peter Ellenshaw, hangs behind the front desk. 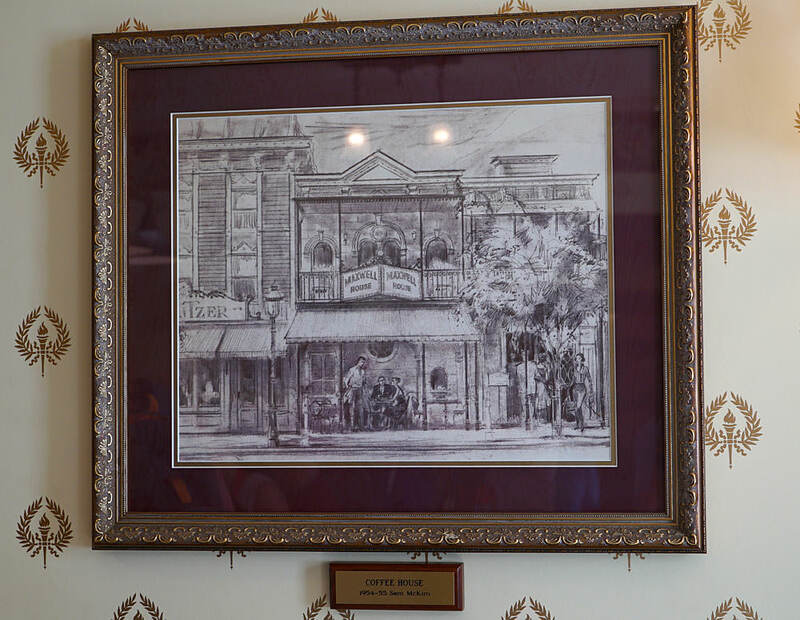 This rendering of the Maxwell House Coffee Shop (1955-1957) hangs in the foyer. 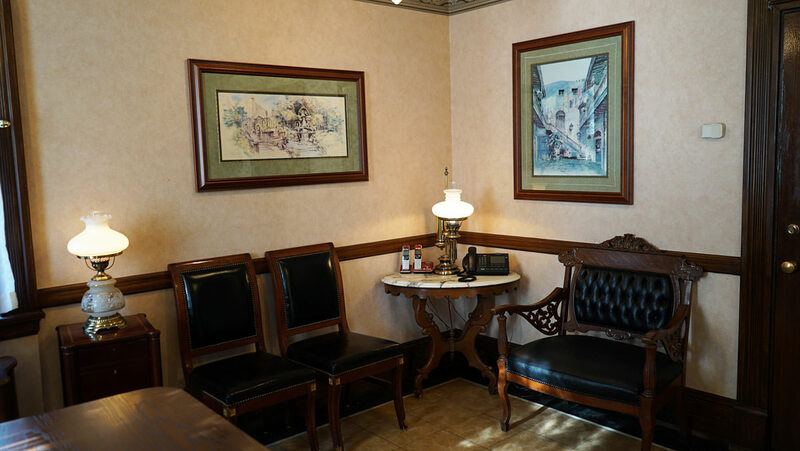 A quaint sitting room off to the side of the foyer. Hanging on the wall are watercolors of Snow White Grotto and New Orleans Square. 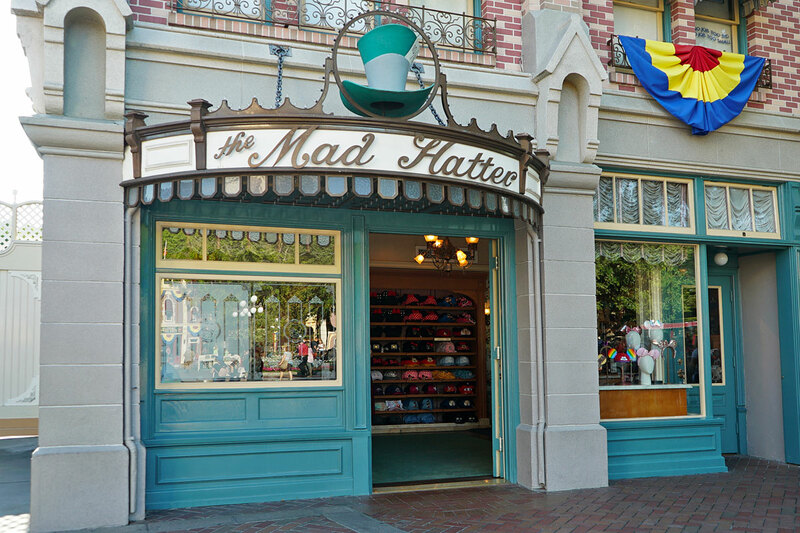 Located next door to the Opera House in Town Square, the Mad Hatter Shop was the second to open in Disneyland. The first opened in Fantasyland, and a third opened in Tomorrowland, which has since been removed. 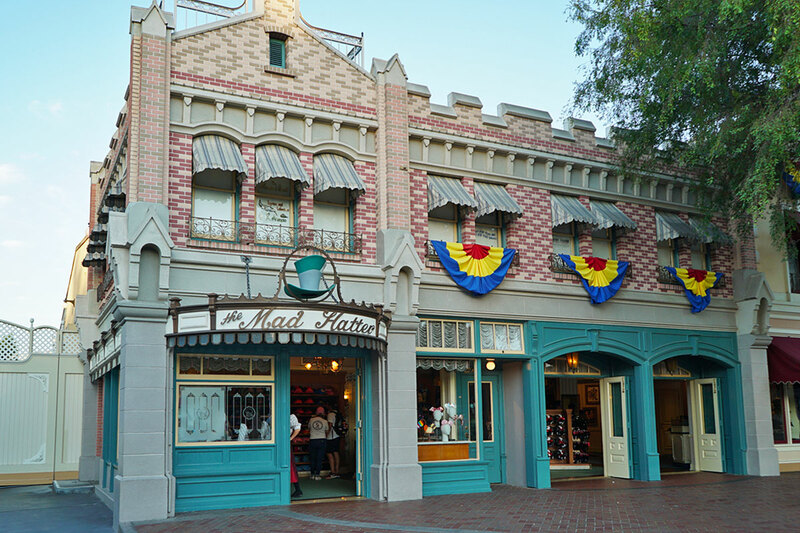 The Mad Hatter opened in 1958, next door to the Coke Refreshment Corner near near the hub. It moved to it's present location in 1963. Xavier Atencio gets a window here. He is most well-known for writing the scripts and theme song lyrics of Pirates of the Caribbean and The Haunted Mansion. 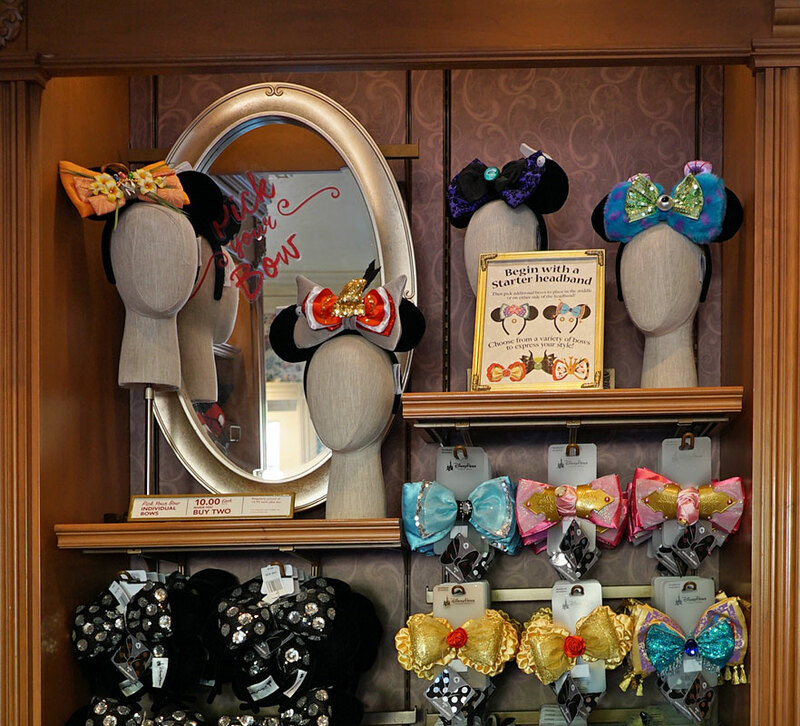 The Mad Hatter Shop is of course named after the character in Alice in Wonderland. 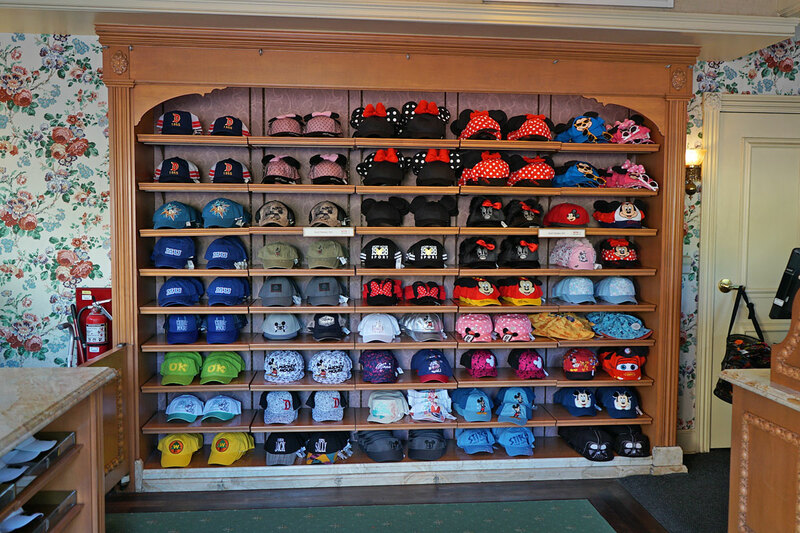 And the shop, as you probably guessed, sells hats...lots of hats. 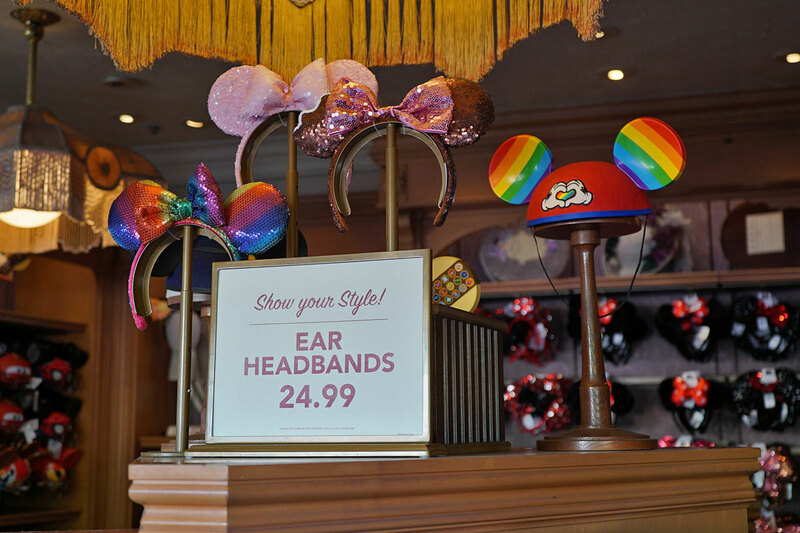 In addition to hats, you can buy many other things that you can wear on your head. 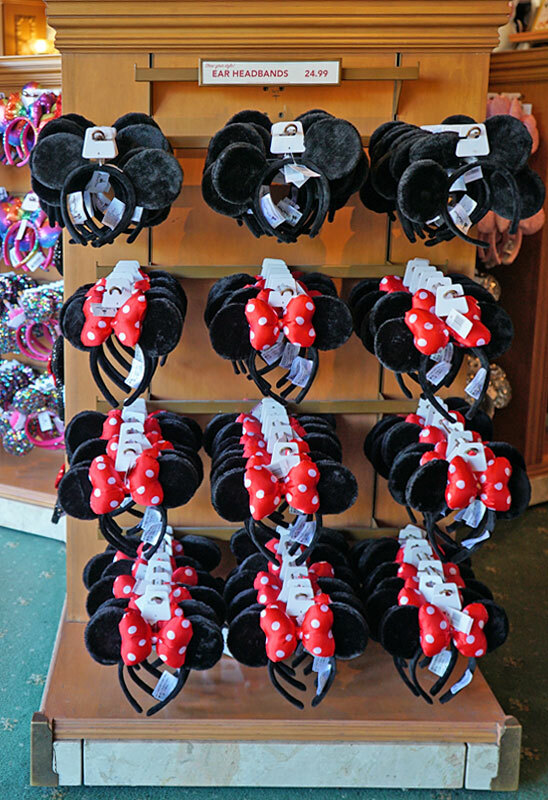 And for an extra cost, you can have your name embroidered on your Mickey or Minnie ears. 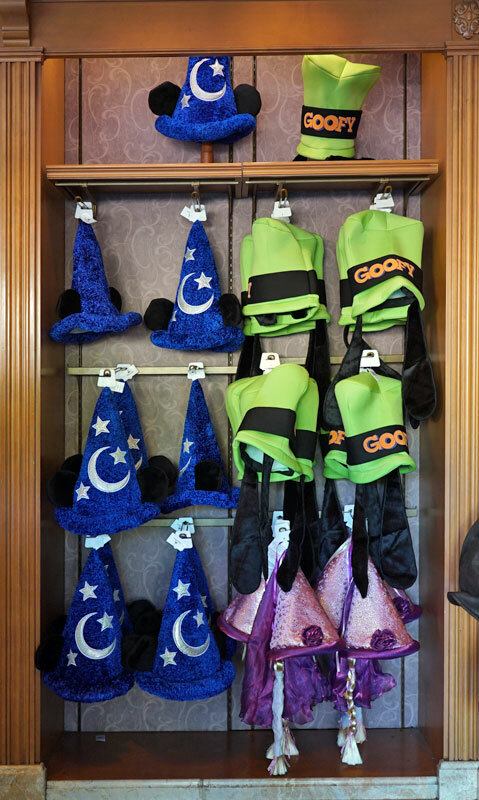 And if you don't want to be Mickey, you can be Goofy, or any number of other characters. The Mad Hatter at night. 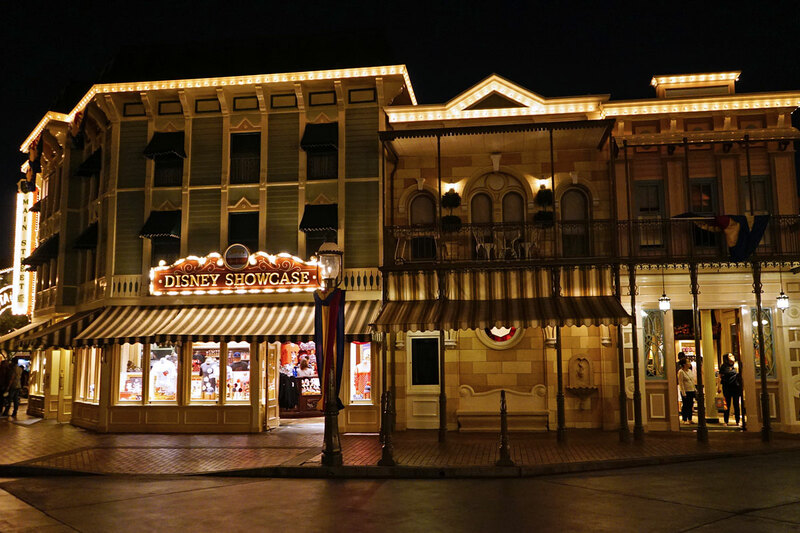 The lighting of main street really is something. Great photos and info shy. 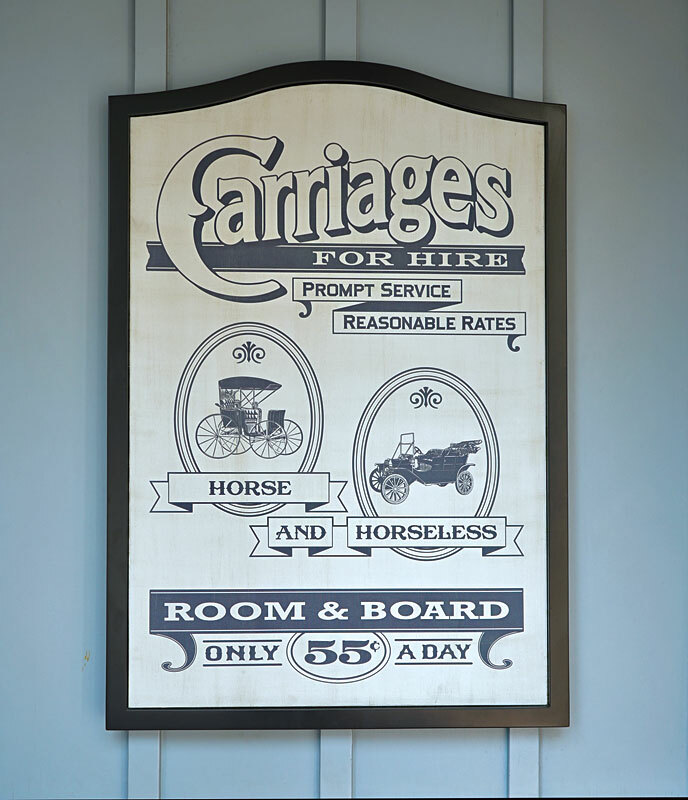 An advertisement for carriages and lodgings. Prices are becoming outrageous these days! 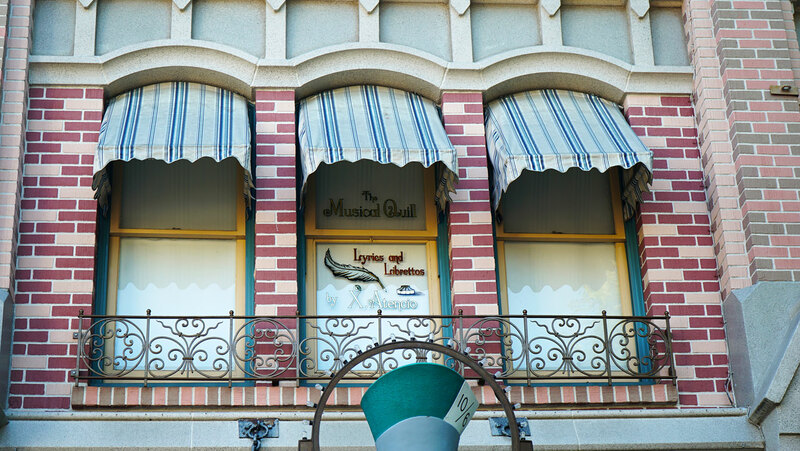 The "escape route" takes you behind the Main Street shop buildings, which until recently, was only for the privileged cast members. And lastly, here's a night shot of City Hall. Them stripping the police station of its identity is something that I don't quite get. I mean, I suppose that an idyllic town would ideally not have crime and thus not need one, but that just reeks of Disney naivete. I'd like to think it's in part the police force that allows an idyllic town to remain idyllic. I mean, after all, they have a fire department so surely it's not perfect. I knew that Magic Kingdom MSUSA had the "escape route", but I had never seen the DL one. Very cool! A lot smaller scale. Them stripping the police station of its identity is something that I don't quite get. I didn't even realize the change until I looked closer at the photo I took. I have yet to find anything about the reason for it. 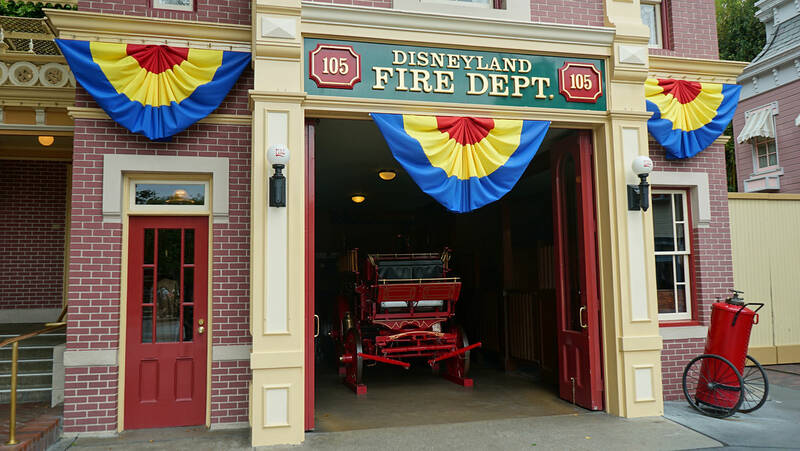 Disneyland's "escape route" is fairly new. It's only been in existence for a few years. This is the first time I've actually used it and I had this Disney nerd feeling of excitement at being in a place at the park that I had never been before. The only other place the attraction posters are displayed (that I recall) are in the tunnels below the railroad tracks leading into Main Street. 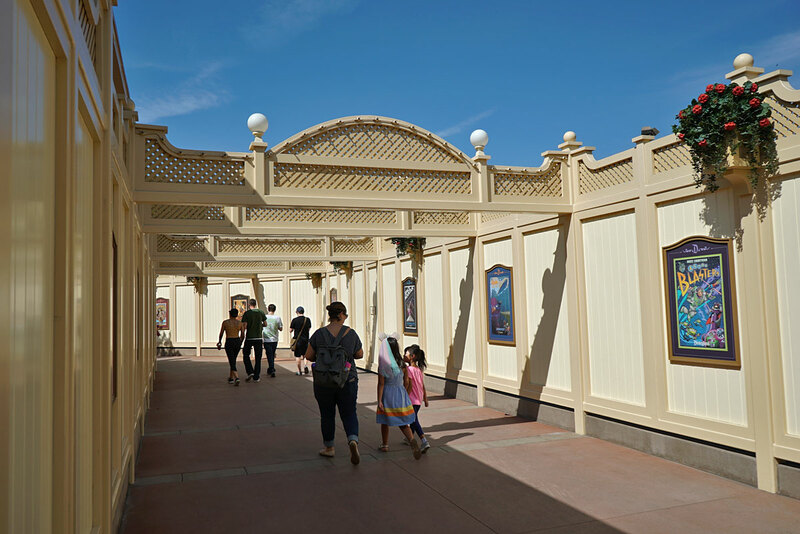 Magic Kingdoms has also not been around that long, but as stated is much wider and more themed look than these standard construction type walls. MK's was going to to be what was connected to the now defunct huge theater that was going to be built. 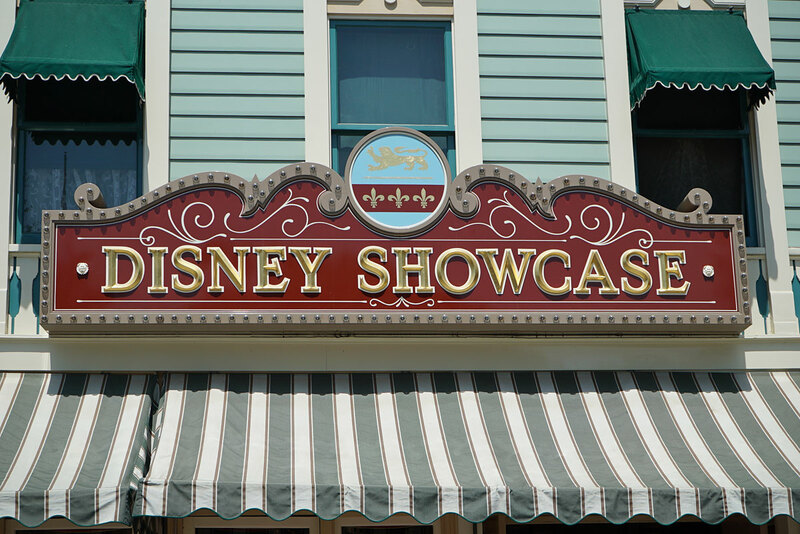 The Disney Showcase stands prominently across from the Emporium on the right side of Town Square. 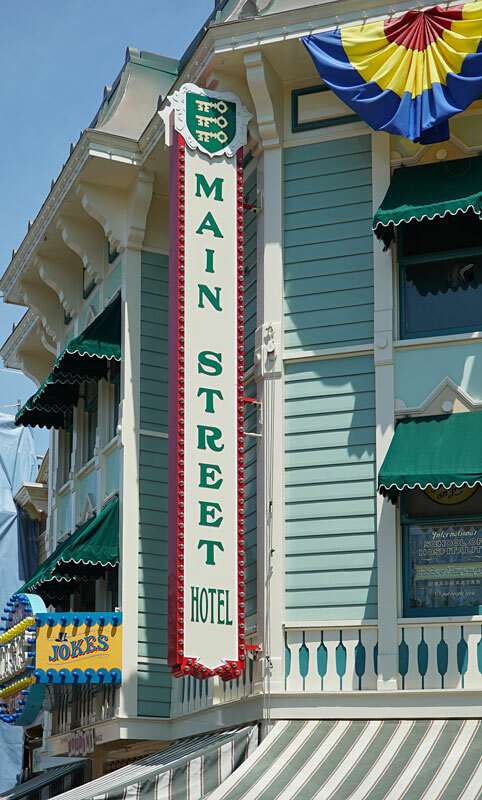 The Main Street Hotel has been home to many things over the years. In 1955, it was home to the Wurlitzer Music Hall. 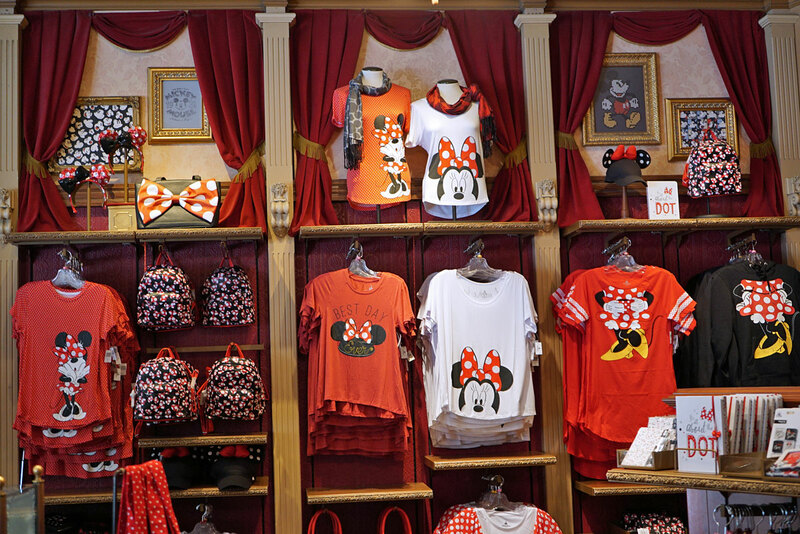 Later years saw The Legacy of Walt Disney and Disneyland Presents Previews of Coming Attractions. 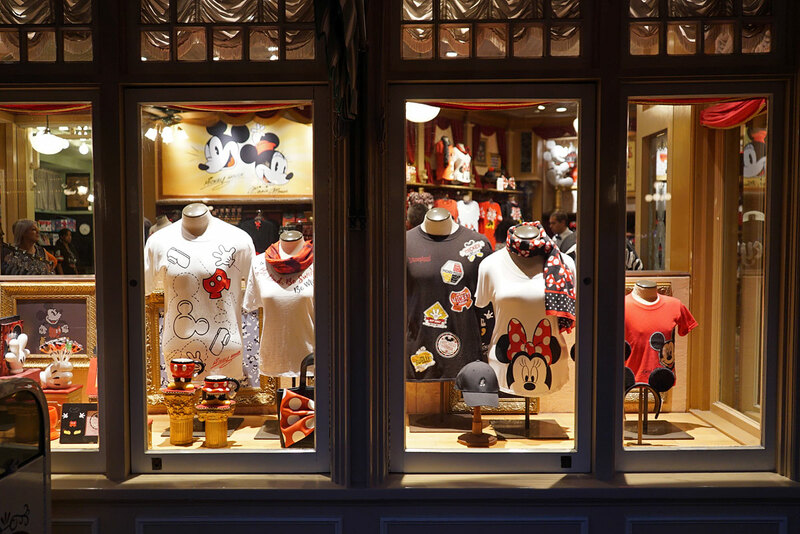 Since 1989, it's been the Disney Showcase, a shop specializing in clothing and souvenirs...mostly Mickey and Minnie themed merchandise. 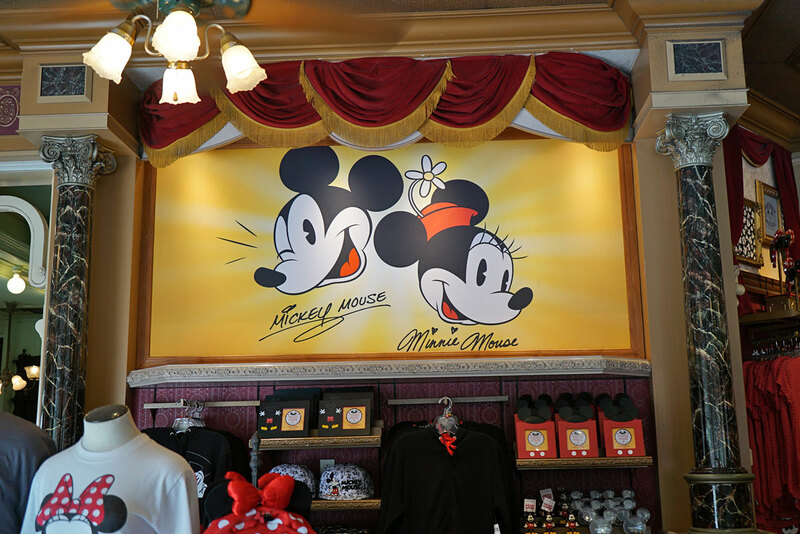 Colorful, theatric displays feature Mickey and Minnie Mouse. 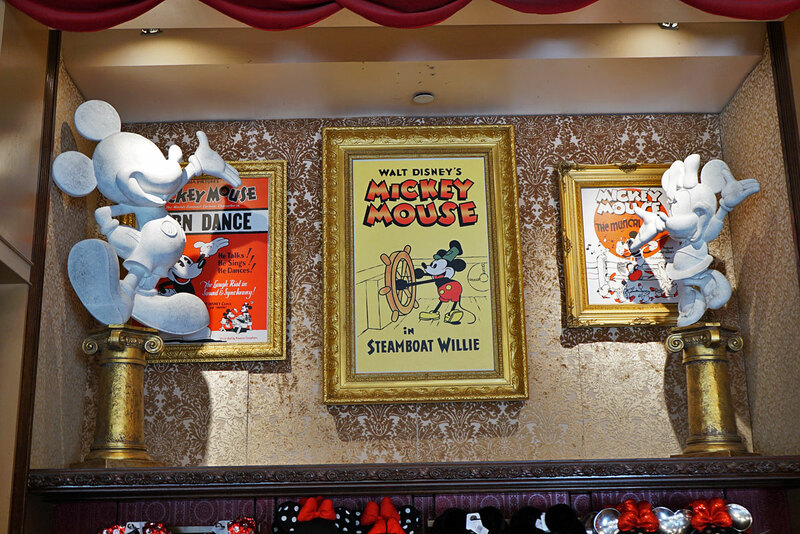 Classic Mickey Mouse shorts are showcased here, including Steamboat Willie, Mickey's debut film. 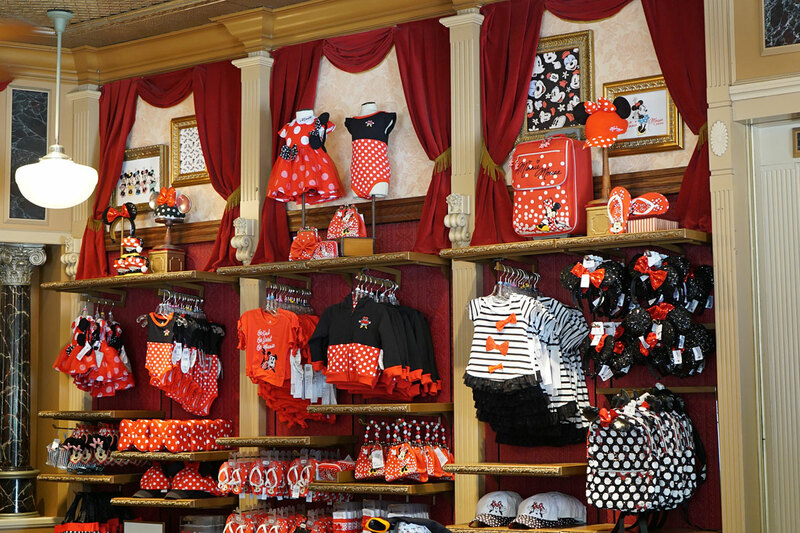 Mickey and Minnie plush toys, etc. 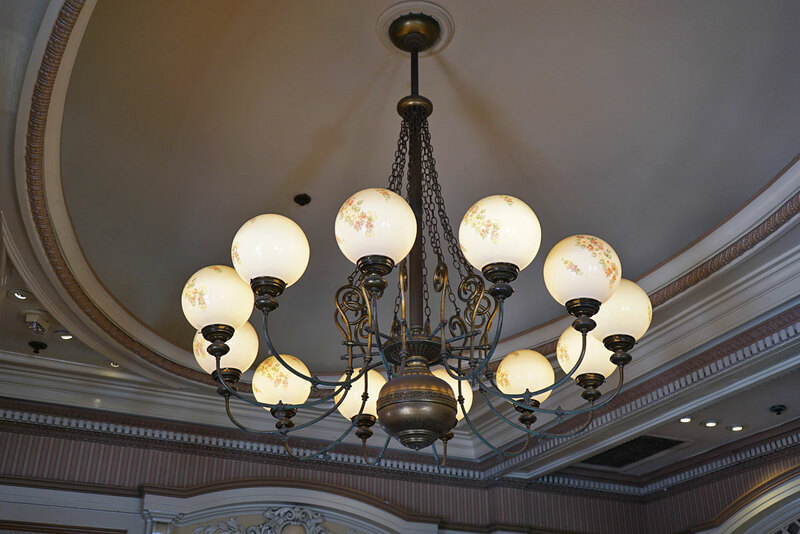 The Disney shops always feature ornate chandeliers. The Disney Showcase takes up the entire right side of Town Square. Balcony seating on the second floor. Although it's just for show. 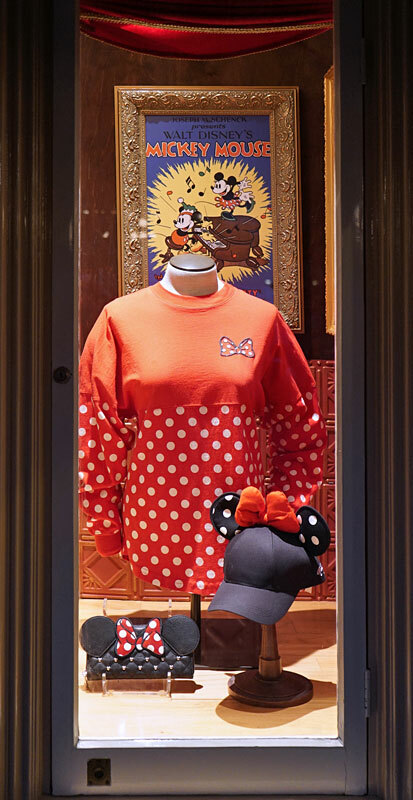 Like many of the shops on Main Street, the Disney Showcase has colorful display windows featuring merchandise for sale inside. Lastly, a night shot of the Disney Showcase. 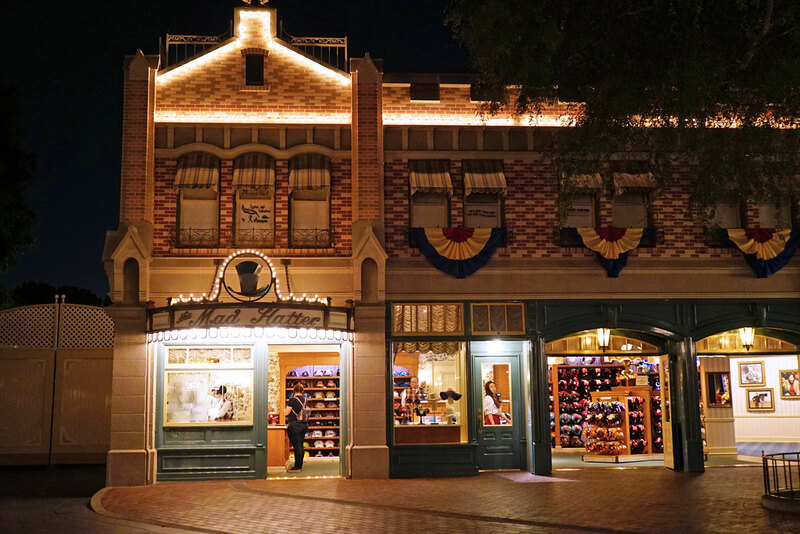 I think Disneyland's version of Main Street is a classic. 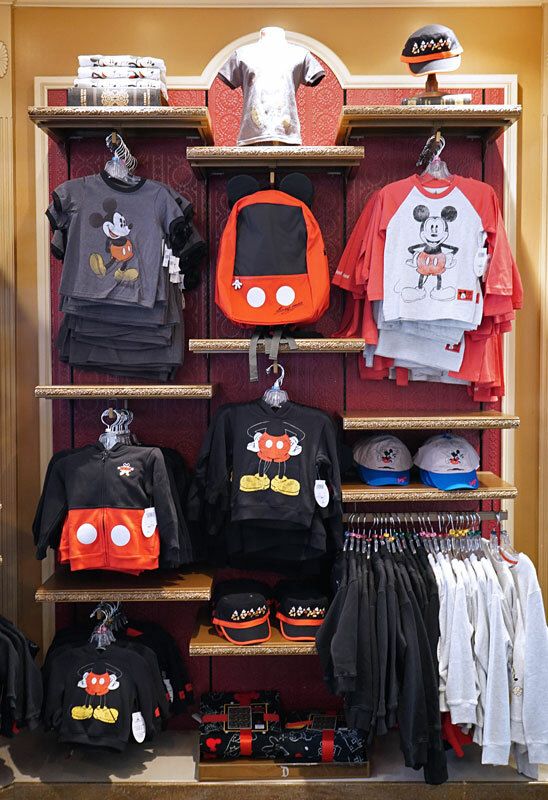 The WDW version is much much larger and a bit more crowded. 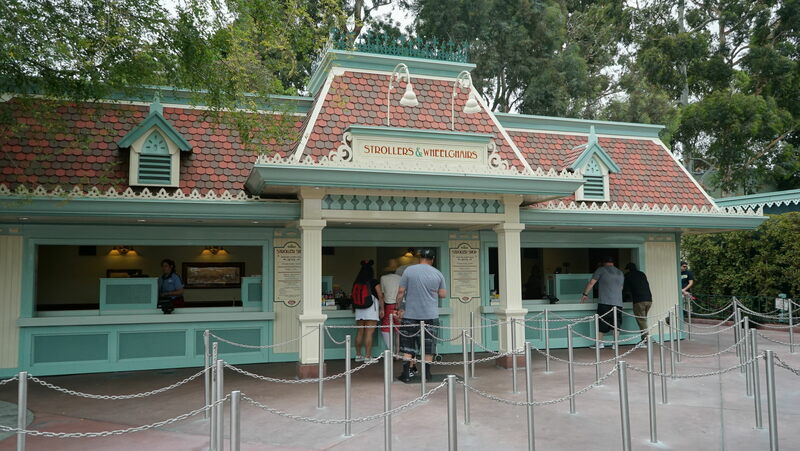 We also do not have some of the restaurants that California has in Main Street. 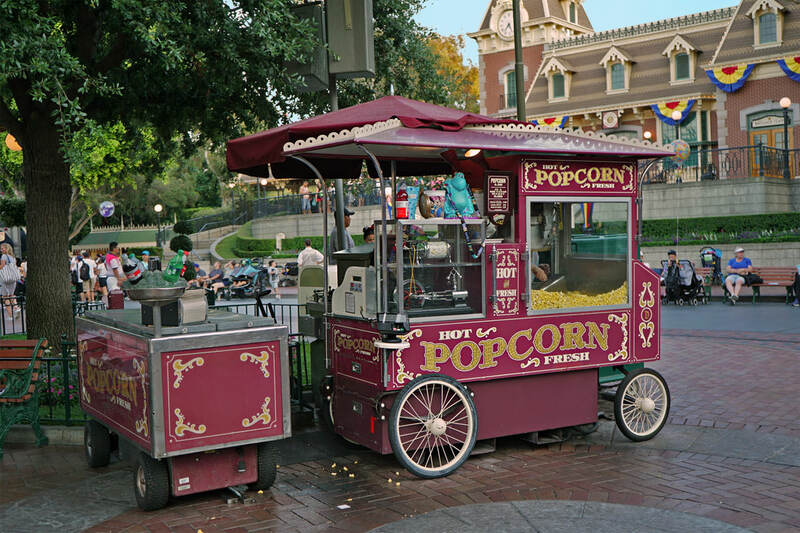 I watch many food vlogs and always find myself wanting to go to Disneyland even more. 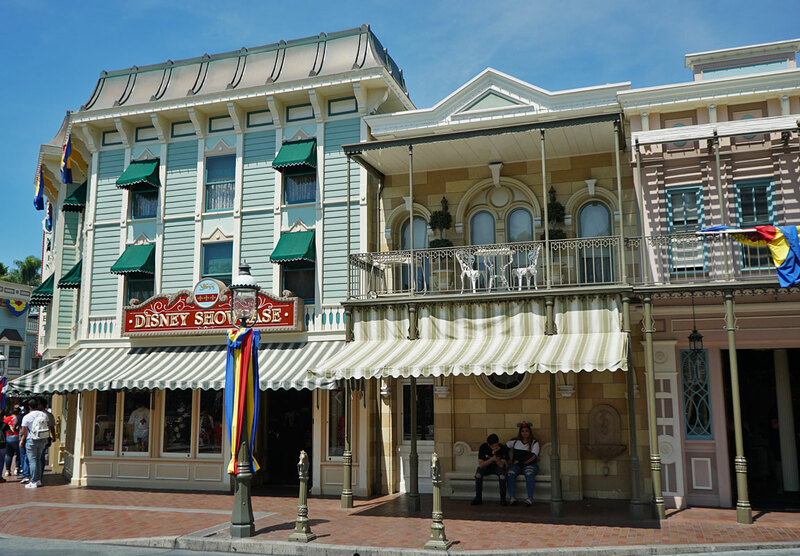 I do like the smaller scale of Disneyland's Main Street. 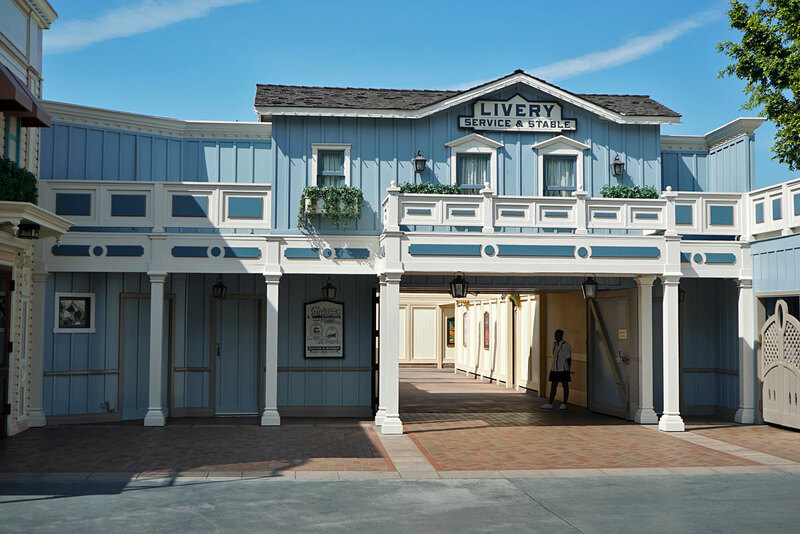 I feel it does give off the feeling of a small town a bit more than the WDW version. Amazing photos shyguy!